One month after the shooting of an Associated Press cameraman in the Gaza Strip, the Israeli military still has not commented on the incident or provided any updates about the status of an investigation. Rashed Rashid was covering a protest near Gaza's northern border with Israel on Nov. 19 when he was shot in the left ankle, apparently by Israeli fire. Rashid was wearing protective gear that clearly identified himself as a journalist and standing with a crowd of other journalists some 600 meters (660 yards) away from the Israeli border when he was hit. Rashid, 47, was allowed to enter Israel for medical treatment. He has been hospitalized at Hadassah Medical Center in Jerusalem to repair multiple fractures and a gaping hole in his left leg. Doctors say the injuries are not life threatening. The army says it typically investigates such incidents, and it has implied that it is looking into Rashid's shooting. But it has not responded to repeated requests for comment or updates about the investigation. It also has not attempted to interview Rashid or other AP staffers who witnessed the incident, or asked to view AP footage of the shooting. "The Associated Press urges the Israeli military to conduct a prompt and thorough investigation into the shooting of its cameraman, Rashed Rashid, who was shot while doing his job," said Lauren Easton, the AP's director of media relations. The AP footage taken by Rashid shows a small group of Palestinian youths several hundred meters (yards) in front of him approaching the border, one of them hurling a stone with a sling shot toward an Israeli watchtower in the distance. A military jeep rolls past, firing tear gas toward the crowd. The popping of sporadic gunfire is heard, including one shot that causes a group of medics to duck their heads and a youth to jump to the ground as a bullet apparently whizzes by. That same bullet appears to be the one that hit Rashid, who is heard screaming in pain a split second later. The medics then point in Rashid's direction and start running toward him. 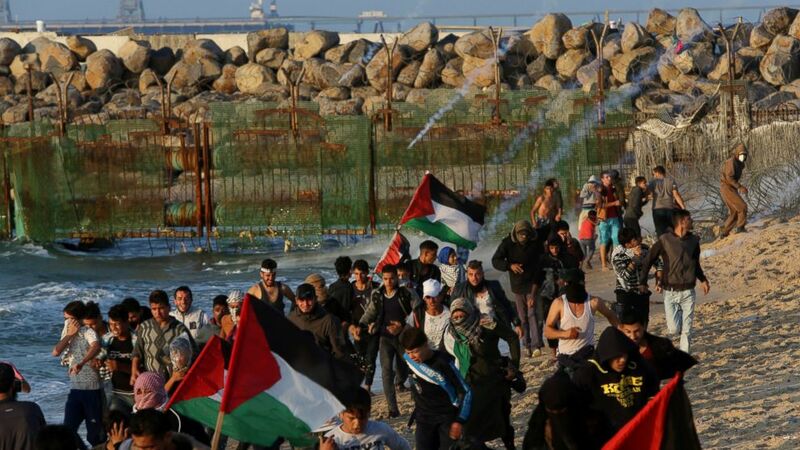 Gaza's ruling Hamas militant group has been orchestrating border protests since March in an effort to break a crippling Israeli blockade. Israel and Egypt imposed the blockade in 2007 after Hamas, an armed group that opposes Israel's existence, took control of Gaza. Some 175 Palestinians have been killed in the protests, and thousands more wounded. Israel accuses Hamas of endangering civilians by using the crowds as cover to attempt to carry out cross-border attacks. Protesters have hurled firebombs, flaming tires and grenades at Israeli troops, and one soldier was killed by a Hamas sniper last summer. But Israel has come under heavy international criticism for the large numbers of unarmed people, including journalists, medics and children, who have been shot far from the border. According to Gaza's Health Ministry, two journalists and three medics have been killed, while an additional 42 medical workers have been struck by live bullets. Palestinians and human rights groups have long accused the Israeli military of failing to carry out serious investigations into possible wrongdoing by troops. Two years ago, the Israeli human rights group B'tselem said it would no longer work with the Israeli military in investigating alleged violations, ending a 25-year relationship. It said only a tiny percentage of complaints of improper violence against Palestinians has resulted in indictments and accused the military justice system of "whitewashing" violations.